Every garden has its moments of beauty, but in general I would just as soon be walking on an isolated beach or through the woods, where I can experience infinite surprise, feel depth in every direction, and sense the presence of a master designer. Last night I saw a film that seemed to collect the best garden moments I've ever had (outside of Kyoto). It said to me: it's less about self-conscious "gardens" in the spring and more about verdant fields year-round. 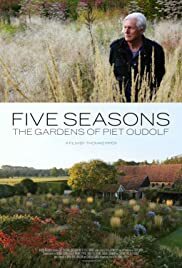 The film, "Five Seasons: The Gardens of Piet Oudolf," might inspire your eyes too. Piet works mostly in Europe, but maybe next week I can take an extra day in NYC to see his planting on the High Line.